Songs of the sea and those who sail upon it have become an increasingly popular part of Tall Ship Celebration. Each festival, we seek out the most talented shanty musicians in the world and invite them to perform for you as part of our maritime festival. Sponsorship supports the appearance of participating musicians especially those traveling from around the world to visit the Great Lakes Bay Region. Bocca Musica is an international, award winning, band based out of the Metro Detroit area. 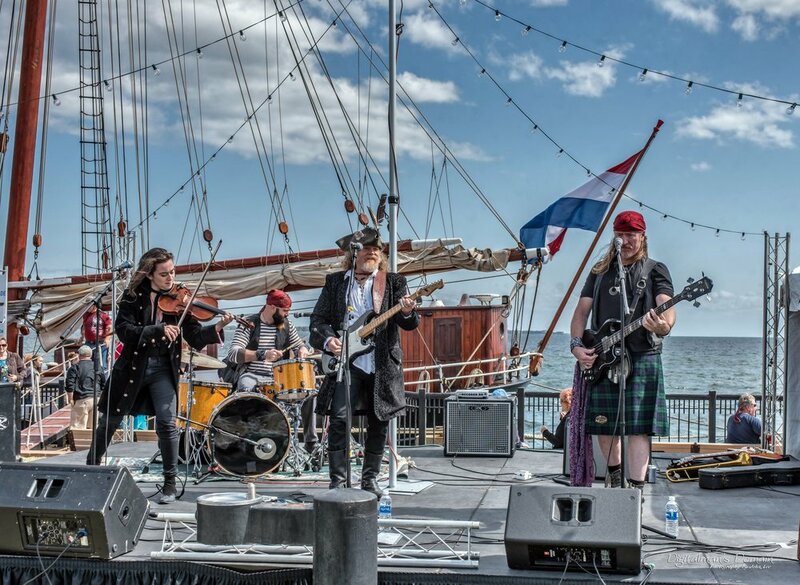 Known for their spicy and raucous sense of humor, they perform a wide range of genres from original pirate and bawdy tunes to Celtic and traditional sea shanties. No matter where Bocca goes or what they sing, one thing remains the same...their love of tight harmonies and making people laugh! With a unique acoustic sound and intricate three part vocal harmonies, Roane specializes in Celtic, folk, and maritime music. Their repertoire consists of traditional Celtic melodies, American traditional favorites, and sea shanties with their own personal twist. Roane’s original compositions embrace the spirit of the storyteller. Pouring out heart-felt lyrics and melodies, their music embodies the soul of their Celtic ancestry, while adding their own modern harmonies and instrumentation. Sasiedzi (the Neighbours) were formed in 2001 in Gliwice (Poland). The name of the band originates from the pub where we first played music together. Initially, we performed mostly folk and sea shanties (maritime work songs performed a cappella in Polish, English, French and Russian). Today, our set list includes our own original compositions. Additionally, we incorporate music from other cultures in our repertoire, including traditional tunes from Cape Breton, Ireland and Scotland, as well as our own Silesian folk and also some medieval folk. The combination of musicians give the band its own unique sound. Magnetism of the group lies in intricate harmonies orchestrate with richly acoustic instrumentation. Sasiedzi have developed our own distinctive style. Sasiedzi have performed over 400 concerts in Poland and abroad (Tatihoo, Paimpol - France; Appingedam - Netherland; Bremen, Rostock - Germany, Bay City and we are the first group from Poland, took place in legendary Sea Music Festival in Mystic Seaport in USA. Formerly part of the Belgian shanty group “Les Mâles de mer” Yves and Manu decided to continue touring and singing the maritime repertoire as a duo, under the name “Two Sheets to the Wind”. With this third invitation to attend Tall Ship Celebration: Bay City, they had no problem convincing their young and talented fiddler to hop on board once more and join them on their journey of shanties, maritime songs and Irish jigs and reels. And just like that, Two Sheets to the Wind became Three Sheets to the Wind! They play their music with a slight pop twist that sets them apart from more traditional bands. Over the years, they’ve had the pleasure of playing all major European venues and Canada’s beautiful province of Quebec and are delighted to be back again in Michigan. They’ll bring you tales of French pirates, British fishermen and Dutch pilots, songs about creole whale hunters and poems of Brittany women longing for the return of their husbands sailing the seven seas. Yves plays guitar, Simon plays fiddle and Manu plays Mandola. Tom Mason and the Blue Buccaneers play with the fervor of the Pogues and the sensitivity of the Buena Vista Social Club. Their songs transport you to the wildest pub in Port Royal at the turn of the eighteenth century. Their new CD "The World is Ablaze" draws on the fact that pirates sailed the world around and pirate crews were an international lot, so their music would be a medley of styles plundered from all over. Tom’s theatricality and musicianship make for an explosive mix. His songs conjure up a life on the seas in an era when the only hope for destitute sailors was to go “on the account”, to become pirates. Za Horyzontem is a Polish folk group whose songs tell stories about the sea from a female point of view. Their music is inspired by Irish folk music and they play their own original material. Since 2003 they have performed almost 500 concerts both in Poland and abroad. Colorful costumes and feminine charm create performances that are entertaining and engaging.